On January 11, the calendar will read 1/11/11. 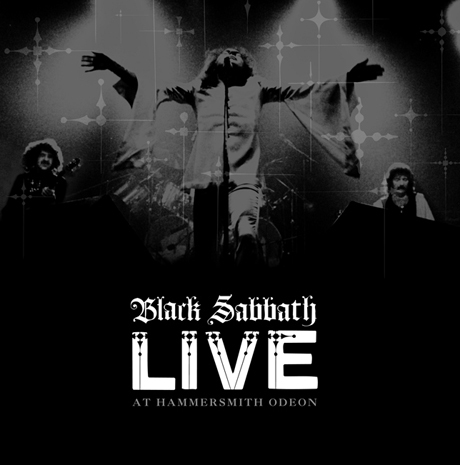 To celebrate the date, occult lovers Black Sabbath will be releasing Live at Hammersmith Odeon on vinyl. The 14-song set was recorded in 1982 at the Hammersmith Odeon in London, UK. This was shortly before (recently deceased) singer Ronnie James Dio left the band, coming hot on the heels of 1980's Heaven and Hell and 1981's Mob Rules. Live at Hammersmith Odeon was previously released back in 2007 as a limited run of 5,000 CDs via Rhino Handmade. These reportedly sold out in just a day. The new three-LP set will be limited to 3,000 copies, which will be pressed on 180-gram vinyl and made available exclusively through participating Metal Club stores. Find your closest Metal Club location here. See the tracklist below, which includes a number of Dio-era songs, plus classics like "Iron Man," War Pigs" and "Paranoid." If you can't wait until January 11 to get your fix of Black Sabbath live cuts, Antiquiet points out that a new soundboard recording of "Hand of Doom" from 1970 just got posted to YouTube. The exact source and date of the recording is unknown, but it's already being called one of the best Sabbath bootlegs ever. Scroll past the tracklist to have a listen. 1. "Children of the Sea"
3. "Children of the Grave"